Violinist Itzhak Perlman and Jewish music scholar and performer Hankus Netsky join host James David Jacobs for an hour of songs and stories celebrating the holiday known as "The Festival of Lights." 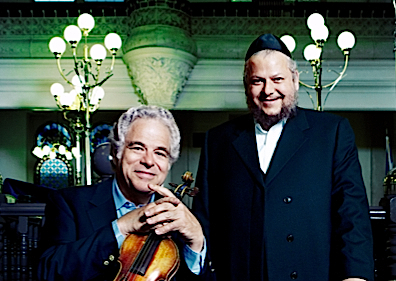 Itzhak Perlman, universally recognized as one of the world's greatest classical violinists, has in the last few years devoted himself to serious study of traditional Jewish music. Hankus Netsky teaches at the New England Conservatory and is a pioneer in the revival of Klezmer music. Netsky served as music director for the Sony album "Eternal Echoes: Songs and Dances for the Soul," a collaboration between Perlman and Cantor Yitzhak Meir Helfgot. Both Perlman and Netsky join host James David Jacobs for an hour of songs and stories for Hanukkah, which includes four selections from their album as well as clips of the historical recordings that influenced them. We'll also hear about the history of the Jewish hymn "Maoz Tsur," which later became the Christian hymn "Rock of Ages"; selections from George Frideric Handel's dramatization of the Hanukkah story, his oratorio Judas Maccabaeus; recordings of both classical and cantorial selections by the legendary tenor Jan Peerce; two musical depictions of a spinning dreidel; Hankus Netsky telling the story of how, thanks to the idiosyncracies of Klezmer music, he became a professional accordion player within a day of his playing the instrument for the first time; Itzhak Perlman talking about the cantorial music he listened to as a child in Israel; and an attempt to convey the experience of making and eating potato latkes through the medium of radio. "A Great Miracle Happened There: A Hanukkah Special," is a conversation between Rabbi Ismar Schorsch and Host Larry Josephson about the history, rituals and meaning of Hanukkah--and its importance in our time. Cantors David Lefkowitz and Elisheva Dienstfrey sing the music of Hanukkah. Rabbi Ismar Schorsch explains that Hanukkah is really about a Jewish civil war, a war between assimilated, Hellenized Jews and a pious band of zealots, the Maccabees. The well-known "miracle of the oil," occurs at the end of the story--after the Temple has been retaken by the Maccabees, and rededicated and cleansed. Rabbi Schorsch also talks about Hanukkah as "the Jewish Christmas." Dr. Ismar Schorsch is Chancellor of the Jewish Theological Seminary in New York. Larry Josephson is a veteran public radio host and interviewer, whose programs have been heard in New York, and nationwide for over 35 years. Glorious music of Hanukkah is sung by Cantor David Lefkowitz of The Park Avenue Synagogue in New York, and by Cantor Elisheva Dienstfrey, now of Congregation Agudas Achim in Alexandria, Virginia. Both are graduates of the Seminary. Additional music from "Voice of the Turtle" and the Zamir Chorale of Boston. Hanukkah can be seen as a holiday about assimilation. Hanukkah has become the pinnacle of assimilation for American Jews. Dreidels and Menorahs hang in holiday displays alongside Christmas trees and wreaths. But the real history of Hanukkah is sometimes forgotten. The ancient war that Hanukkah celebrates was very much a civil war between religious and secular Jews. A former Orthodox Jew explains (while cooking latkes) how this 2,000 year old struggle over assimilation has affected her life.